West building and 03 stack in Four Seasons of Romar Beach Condominium. These units just don't become available often. Amazing floor plan and split bedroom plan in this 3/3 gulf front condo. 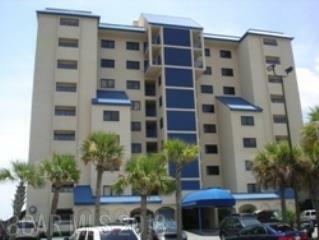 Beautiful decor and maintained unit with a very strong rental history. Four Seasons offers indoor heated pool, outdoor pool, exercise room, guard gate and full time security, on site manager and an incredibly landscaped and lower density feel. On top of all the unique and special benefits Four Seasons offers a private fishing pier only for owners and guests in the Gulf of Mexico. The views, sunsets and of course the fishing can be fantastic and you won't find this amenity anywhere along our coast. Annual assessment each March 1st. 2016 special assessment was $ 3,516.98. Showings by appointment with 24 hr notice. On lockbox. Some personal items not to convey. Measurements are estimates. All information including but not limited to measurements should be verified by buyer and/or buyer's agent.